Zombies are definitely all the rage now. With The Walking Dead claiming to be the highest rated original scripted series on cable television, SyFy following suit with their own campier Z Nation, and even The CW getting in on the act with the supernatural comedy/crime procedural iZombie, there’s no doubt that the brain eating undead have arisen to rival their long more popular monster rivals vampires and werewolves for the affections of the viewing public. George A. Romero was really onto something back in the day. Now the plodding monsters have gone international and made a serious splash in South Korean writer/director Yeon Sang-ho’s action/thriller Train to Busan. Yeon borrows heavily from the mythology of the zombie for his film creating an almost instantaneous zombie apocalypse that takes over all of South Korea, its origins unknown, but we pretty much figure out how it spreads early on – the undead bite you and you turn into one of them. But Yeon’s zombies are a different breed. They may be voracious and dimwitted, but they certainly aren’t plodding “walkers”, these things can move. That brings us to the film’s main setup, the train to Busan. A workaholic fund manager Woo Seok (Gong Yoo), separated from the wife who left him, is taking care of his young daughter Soo-an (Kim Su-an) with his mother. It’s Soo-an’s birthday and, upset that her father works too much and only cares about himself, she wants to go be with her mother, even if it means riding the train to Busan by herself. Seok relents and takes time off from work to take his daughter on the bullet train to Busan so she can be with her mom for her birthday. He only realizes too late that the nation is in the midst of a zombie apocalypse and it has spread onto the train via an infected passenger who attacks one of the unsuspecting attendants. Seok then teams up with the brawny Hwa Sang (Ma Dong-seok) who is onboard with his expectant wife Seong-kyeong (Jung Yu-mi). The two don’t like each other because they come from different walks of life, Seok being a white-collar, fund manager and Hwa Sang a construction worker, but they quickly see that the only way to survive is to put aside their grievances. The latter point is another way in which Yeon goes right to the roots of the zombie mythology, wrapping social commentary into his thriller, which is something that has been part of the genre going all the back to Romero. It seems almost impossible to make such an epic zombie film without turning into a lager allegory on the world at large and Train to Busan is both of those, epic and an allegory. With the sweeping social change the country has seen over the past few decades due to economics, politics, now its ongoing unrest due to political corruption scandals, its emergence onto the world stage as an emerging economy, the renaissance of its film industry, much of this can be seen in the paranoia of a zombie film and the archetypes of the people fighting against them. There’s the corporate boss on the train who tries to take command and, like a typical “overlord”, protect himself at the cost of the lives of everyone else. The zombies are the imposing threat that can either bring everyone together or divide them. The film is epic, not in its length, but in its incredible visual effects. Waves of zombies piled up on each other attack in hordes. Trapped on a bullet train and in those moments when the few uninfected passengers try to disembark, the zombie stampedes in quick motion on the rail platforms are an edge of the seat sight to behold. Korea has more than made its mark on the film industry around the world, arguably surpassing its neighboring nations China and Japan in live-action (Japan unquestionably still rules the Asian market and beyond in anime and animation). Train to Busan is yet another feather in its cap and another reason to take note of the films coming out of South Korea. Train to Busan was shot digitally on Arri Alexa XT M and Arri Alexa XT Plus cameras at 2.8K resolution and a 2K DI (Digital Intermediate) was used. It is brought to Blu-ray in a 1.85:1 AVC 1080p encodement by Well Go USA. The overall image quality is very pleasing with strong detail and contrast, natural color reproduction and nuanced shadows. While most of the time there are no serious flaws that can be spotted, there are some spots where one can see some issues that look to be inherent to the source. A scene entering a tunnel* has extremely bad banding that dissipates once the bright lights return. Apart from that, the depth of field and textures presented are exceptional. 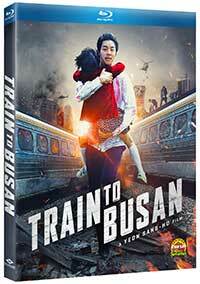 Well Go USA offers up a sumptuous Korean DTS:X mix of Train to Busan. An English dub is provided in DTS-HD Master Audio 5.1, but really, go with the original-language track unless you like watching lips out of sync and actors that sound oddly disconnected from the action. The mix is a good one with, if not full-on aggressive use of those “X” channels, a very atmospheric usage with strong sense of height that spreads a lot of the score through the X and surround backs. The stereo imaging is widely panned and low-end is deep for the sound effects. Dynamic range is strong which is a good thing for this sort of action film. The quieter scenes are handled delicately also and little sounds in the multiple channels keep us engaged. The mix is focused mainly in the center and front left and right, but the additional channels are well-balanced and dialogue stays clean and above the intense foley effects. We also get a punchy mid range that provides terrifying growls from the zombies. Behind the Scenes (1.78:1; 1080i/60; 00:13:01) – Here we get lots of B-roll footage from the production of Train to Busan. That’s a Wrap (1.78:1; 1080i/60; 00:04:35) — More B-roll from some of the final production moments with some overlap from the Behind the Scenes B-roll featurette. If you love zombies, then you need to see the awesomeness that is Train to Busan. The film doesn’t answer all the questions, so there is definitely an opening left for a sequel, but it is hard to see how this one can be outdone. An exhilarating, edge of your seat thrill ride through zombieland. A definite must for anyone who loves zombie flicks.